There is no dearth of historical monuments in Delhi, but who knew that a paan shop is interlinked with our country’s illustrious past and has been a part of its urbanscape for quite some time now. S.N. Pandey & Sons, a Benarsi paan specialist, has been running a thriving business for 65 years. And when we say thriving, we mean they’ve gone straight to the top – they are the official paan caterers for the Raj Bhoj held at the President’s house each year! The story began a couple of decades before independence, when the patriarch of the Pandey family, Ayodhya Prasad Pandey, came to Delhi in search of a job, leaving the farmlands that their family held in Ayodhya. His son, Shiv Narayan Pandey, decided to become an entrepreneur and set up a paan shop in 1947, at the outer circle of B-block in Connaught Place. 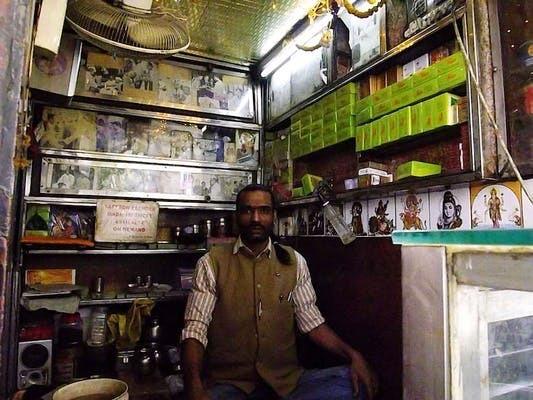 A landmark-of-sorts among Delhiites, this paan shop has seen history unfold, up-close and personal. Testimony to Mr. Pandey’s statements lies in the rear of the tiny paan shop – a display of a series of photographs of personalities like Vyjayantimala, Zakhir Hussain, Saeed Jaffrey, Indira Gandhi, Shatrugan Sinha, M.F, Hussain and many others, shaking hands with Pandey or simply sitting and chilling at his shop. “Nehru was a regular here and even Obama, Bush and Clinton were served our paan! But now, old age has caught up with me… though I try sitting here every evening. This is why I have taught the business to my four sons,” adds the veteran. Hanumant Pandey, the eldest son, entered into the business after he completed school. “For the first four years, my job was to keep the shop clean. It was much later that I was taught how to make a good paan,” says Hanumant. Talk about strict training! He is deeply religious and begins his day cleaning an array of idols that line the shop. He then waters the Tulsi plant placed outside, once in the morning and also at night.